I’m sure by now, you’ve all heard of the monumental shambles that was the Fyre Festival saga. With Netflix and Hulu both releasing their own documentary about the 2017 festival disaster, it’s brought the story back to our attention and now – it’s even bigger than ever. From the documentaries we learnt just how far down the rabbit hole Fyre Co-Founder Billy McFarland went to try and create one of the biggest social media buzzes of all time. And to an extent, he did… just maybe not quite how he would have liked it to have gone down. But take away the cheese sandwiches, the hurricane tents and the fact that the festival never ended up happening despite people arriving on the island, it actually taught us a lot about the world of PR. No, we’re serious! Sure, the whole event was a PR disaster which, at the heart, was created solely to promote a musician bookings app called Fyre. But they had some interesting ideas that just lacked the strategy and planning (oh, and budget). Just by watching the documentary, we learnt that it all started with a few orange tiles on Instagram, simple. And I’m sure most of you saw them yourselves. The likes of Bella Hadid and Kendall Jenner were sharing them and from there – the hype began. Sure, it cost $250,000 per Instagram post for Bella, Kylie and all the other top models and influencers which is incredibly unsustainable. But it certainly did put the message out there. 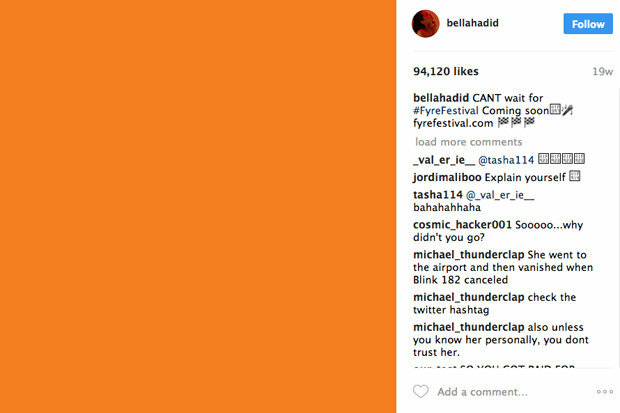 A simple orange tile created a buzz, people wanted to know what was going on, who was going to be there and what ‘Fyre Festival’ was actually going to be. We cannot stress this one enough. If plans change, you have to let your consumers know about it. If something (like the actual music festival) is cancelled, you have to let people know! What turned this flop into a viral disaster was that nobody from the events or communications team put out any statements about what was going on. The only thing we (the rest of the world) heard was all the trouble going down from the Fyre Festival attendees who were now stranded on the island. It may sound simple, but you can easily get swept away in an idea that completely loses what your original goal was. Fyre Festival was used as a marketing tool to promote and launch the celebrity booking app. However, Billy McFarland wanted to make it the biggest event ever. They originally obtained an island previously owned by Pablo Escobar, they hired models, promised villas, ‘created’ their own form of digital currency wristbands and promised huge headliners in the efforts of making it the biggest festival ever. The damage created was permanent and the Fyre app became irrelevant. Even Co-Founder Ja Rule claims he was scammed by McFarland in his efforts to create a hype. But not all hype is good hype – remember that. If you’re publishing a promotional video that looks like the most incredible time/place/event on earth, you need to make sure that you’re delivering the goods. McFarland lost the use of the island formerly owned by Pablo Escobar because he mentioned it in his promo video – something he was told he was not allowed to do. But rather than letting attendees know that the island was changing because of this, they pitched a new location as it’s own ‘private island’ to pretend it was a similar venture. Villas were promised and attendees were left with slumming it in hurricane relief tents. Make sure your message matches the delivery – that is the key to success. If you over hype, you will only ever leave people feeling disappointed as it’s near to impossible to match the fictional buzz created. If the documentary taught us anything, it’s that you can’t just ‘wing it’ when it comes to a big campaign. You need to have your costs, plans, schedules and resources (to name just a few things) all mapped out and detailed with military precision. Too many things changed in the Fyre Festival’s plan with pure chaos, no organisation and very little communication with the attendees. Whatever you do – please don’t be a Fyre Festival… learn from their mistakes.